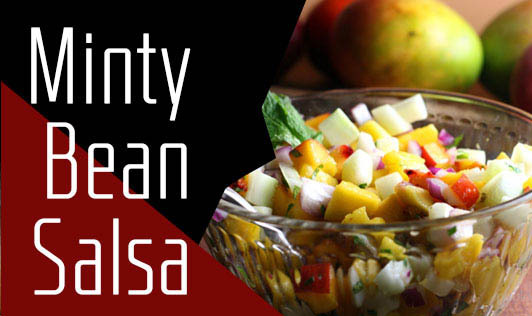 Minty bean salsa makes for a good accompaniment to a main dish. The fresh mint, tomato, coriander, and lemon used, not only gives zing to the dish but also increases the nutritional value by providing essential nutrients like vitamin A and C, folic acid, and iron. You can serve it at room temperature or serve it chilled. Pressure cook 1 ½ cup of soaked black eyed peas (lobhia), 3 to 4 whistles. Serve immediately or refrigerate for 1 hour and serve chilled. ½ cup of dry black eyed peas will give you approximately 1 ½ cups when cooked. Make sure you don’t overcook the peas.